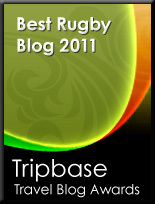 TOTAL FLANKER...a rugby blog: Have we all gone Trophytastic? Is it just me, or are there now a ridiculous number of trophy presentations during the Six Nations? Once upon a time (which I hesitate to refer to as the "good old days" for fear of sounding like a bitter old fart) you didn't even get anything for winning the whole championship, not even if you had secured the coveted Grand Slam - just a "well done," a slap on the back and a place in history. And the one trophy that was presented every year since 1880, the Calcutta Cup, ended up bruised and battered after doubling up as a rugby ball during an impromptu skirmish between Dean Richards and John Jeffery on Edinburgh's Princes Street back in 1988. Nowadays you can't move for trophy presentations - not only is there now a trop hy for winning the championship (which, I guess, is fair enough), but there's also a trophy for winning the previously ethereal Triple Crown, there's the Millennium Trophy awarded to the winners of the annual Ireland v England clash and, since 2007, there's now the Giuseppe Garibaldi Trophy awarded to the winner of the annual match between France and Italy. It seems that there's barely a game goes by in the championship these days without the winners being presented with some meaningless prize to parade about. Of course, this trophy obsession isn't just limited to the Six Nations. We all know about the Bledisloe Cup, competed for by New Zealand and Australia for over 70 years, but we now also have the Lansdowne Cup (Australia v Ireland), the Mandela Plate (South Africa v Australia), the Dave Gallaher Trophy (France v New Zealand), the Tom Richards Trophy (Australia v the Lions), the Freedom Cup (New Zealand v South Africa), the Puma Trophy (Argentina v Australia), the Cook Cup (England v Australia) and the Bicentenary Trophy (France v Australia), to name but several. It's as if no game can have any meaning unless the winning team get to pose for a picture and show off whichever pot, shield or cup has been deemed the appropriate prize for that particular game. Flanker, I dare anybody to TRY to award the wooden spoon to any rugby club...the presenter would end up with spoon shoved where the sun does not shine. I agree though on too many trophys(must be something about guys in our age group)I think there should be a Six Nations trophy-that's it. Maybe the Triple crown trophy became kind of a door prize for the non-french teams to have some hardward during the years when France wins the Six Nations. In the end, I agree, but I don't see that changing anything. It's almost like some politically correct American parent got into the IRB to make sure that everybody gets something. The Triple Crown itself harks back to the days before France were involved - when i was just the "home nations" championship but it was always just a title - the actual championship and Grand Slam (neither of which had trophies either) becoming far more more coveted as time went on. The introdction of a trophy over recent years is nothing more than a gimmick. Bah humbug.